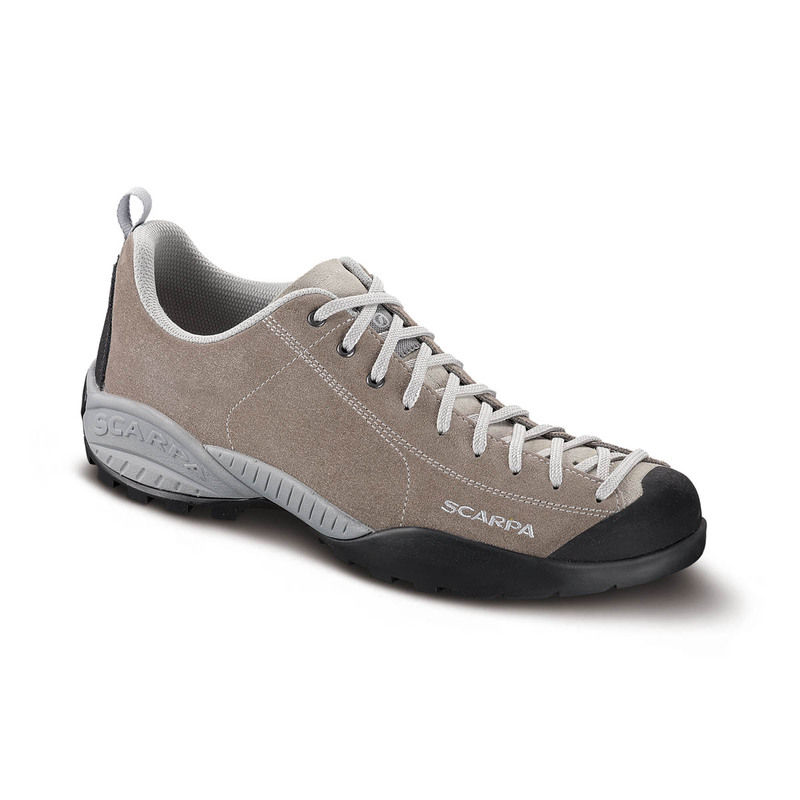 The SCARPA Mojito is a lightweight, comfortable, yet grippy approach shoe (Scarpa’s most popular shoe, in fact), for light approaches, everyday wearers looking for performance in a shoe that feels like a trainer, or workers in need of a grippy, durable, and comfortable shoe. The Scarpa Mojito’s popularity stems from its lightweight versatility and supremely comfortable feel rarely found in an approach shoe. A Vibram SPYDER sole is designed specifically for hiking and light approaches, utilising areas for traction on rough terrain and a “climbing zone” for more technical scrambles. A thermoformed EVA midsole provide the right amount of stability, support, and comfort for long days and rocky terrain. The leather upper and hard midsole will also mould perfectly to the foot’s shape over time for an ergonomic fit and feel. Water-resistant upper, abrasion-resistant leather exterior. Up-to-the-toe lacing system for a climbing shoe-esque fit. LAST BM Last: All day comfort last suited to a mix of light approach and every day comfort. Hexagonal suction pads in the centre of the sole guarantee excellent traction, while the sculpted outline ensures grip and hold. "Climbing zone" for use on rock walls. Midsole in double-density thermoform EVA to guarantee comfort and stability. I've had my eyes on these for quite a while! I've actually worked in two outdoor-shops and I always thought: "Damn, that's the classiest approach shoe they make". Then I saw one day randomly these kicks in sale on EpicTV-Shop: 60EUR for a pair! I instantly ordered those in grey! And in retro-perspective, I'd definitely pay the full price too. Snug and simple, good looking for almost every event (however, you probably should slip into something more classy in case of a wedding or so). It feels like they grip onto rock perfectly. Definitely recommended my friends on this one! True to the size.. light, robust and pretty cool looking for every day use. Hope that is crafted on same level as everything else that i mention before. mojito as well perfect, thanks to epicshop for good price.